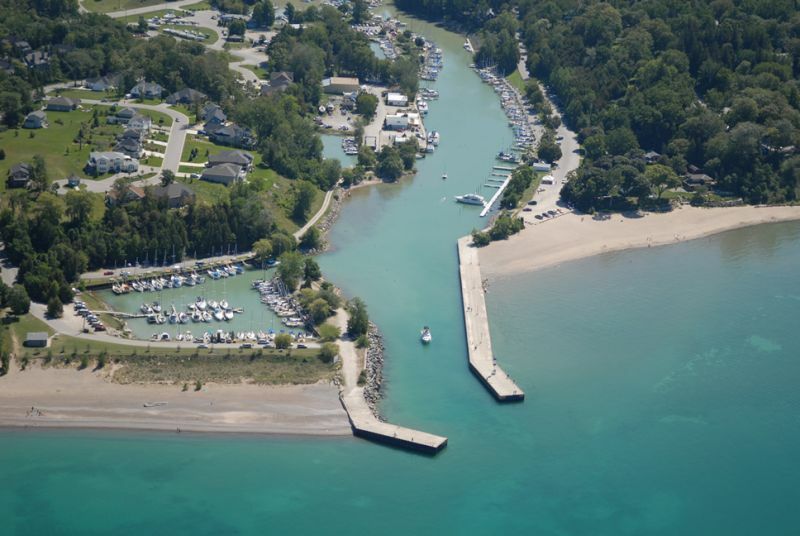 The Main Bayfield Watershed is one of five sentinel watersheds that are priority areas for the southeast shoreline of Lake Huron. The long-term monitoring and on-the-ground actions in this watershed are helpful in providing lessons learned that can be applied to the benefit of all Lake Huron. 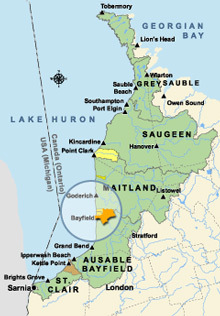 The Main Bayfield Watershed is a subwatershed of the Bayfield River. Main Bayfield Watershed encompasses 92 km2 (square kilometres) – 19 per cent of the total area drained by the Bayfield River. 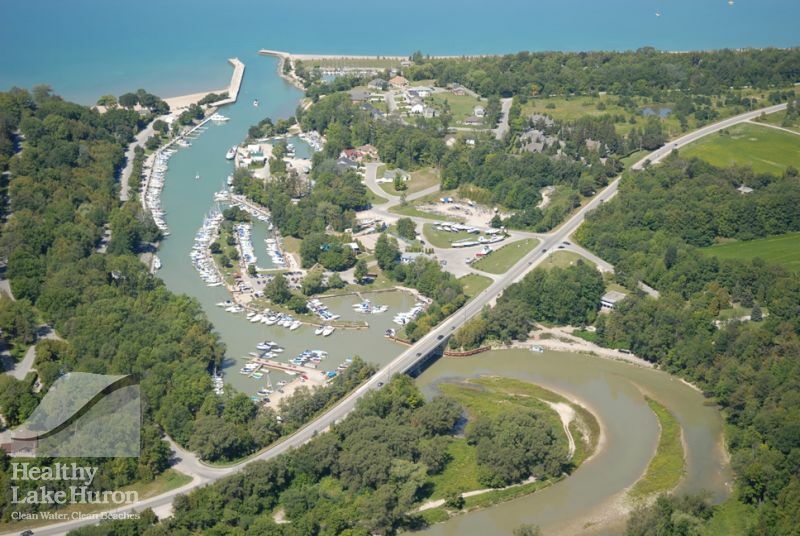 This section of the Bayfield River stretches from west of Clinton, to its outlet at Lake Huron in Bayfield, and spans the municipalities of Bluewater, Central Huron, and Huron East. Land use within the watershed area is predominantly agricultural (62%) and natural area (31%). The remaining area is comprised of small urban centres. Significant natural areas are concentrated primarily along the watercourses, with amounts of forest, wetland, and streamside cover being above average for the entire Ausable Bayfield Conservation Authority (ABCA) jurisdiction. An Area of Natural and Scientific Interest (ANSI) is contained within the Main Bayfield Watershed, which was designated on the representation of certain biological features. In the autumn of 2013, a long-term, community-based watershed plan was launched for and by the watershed. A community advisory committee that had been meeting since 2011 summarized the challenges facing this watershed and presented corresponding actions that would help improve water quality. Following the key strategies of the Lake Huron-Georgian Bay Initiative for Community Action, the Main Bayfield Watershed Plan builds awareness, supports community involvement, and helps to implement actions to protect and enhance the watershed. Recommendations in the plan include following principles for Community Action: Build Awareness, Involve the Community, Take Actions such as establishing buffers and rain gardens, creating wetlands or berms, maintaining crop residue, following nutrient management plans, and planting windbreaks and trees on marginal land and Monitor Effects. A community advisory committee is raising awareness about the plan through local events that have included a rain-barrel sale, rain garden workshops, and watershed walks to gather more information about how water flows over the landscape. The Fred A. and Barbara M. Erb Family Foundation, a U.S. foundation dedicated to nurturing environmentally healthy and culturally vibrant communities in metropolitan Detroit and supporting initiatives to restore the Great Lakes Basin, provided Ausable Bayfield Conservation with $100,000 for continued implementation of the local watershed plan. The Ontario Ministry of the Environment and Climate Change and Environment and Climate Change Canada also contributed. In addition to quarterly newsletters, many outreach events (e.g., hikes, rain barrel sales, tree planting, festivals/fairs, cover crop fora, etc.) have taken place to keep landowners up-to-date on what is going on in the Main Bayfield Watershed. Most recently, rain garden workshops were offered to both homeowners and contractors so that rain gardens could be implemented to help manage urban stormwater (water running off of land during storm events). 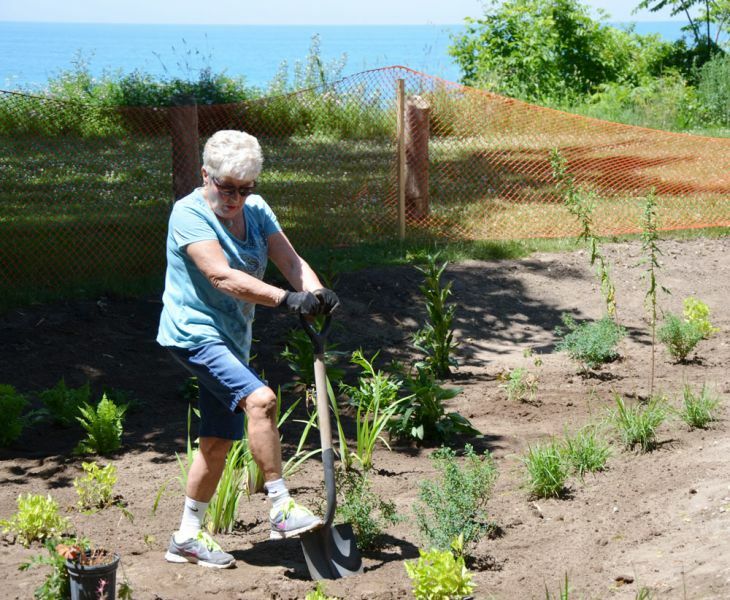 These workshops build on the demonstration rain gardens that were installed in Bayfield in 2016 and another one which was scheduled to be installed in the summer of 2017 in Clinton. Partnerships with local organizations and municipalities were essential in the success of these projects. On the rural landscape, four watershed walks have been completed since 2014 which have allowed for the identification of almost 250 best management practices (BMPs). Community partners have completed or committee to, eighteen BMPs following these walks, and 22 additional BMPs have been completed elsewhere in the watershed since 2014. BMPs consist of erosion control, wetland, cover crop, tree planting, and rain garden projects. Citizen scientists have been active in collecting stormwater samples along the Bayfield beach since 2014, while other landowners have been collecting turbidity measurements at upstream and downstream locations. The Bayfield Main Beach has proudly displayed the Blue Flag since 2009.